1. When the light goes off my eyes become all pupil, gathering the stray packets of light into them and catching areas of greater darkness, marking boundaries and judging distances, all within a moment. When the light returns, I am blinded; my pupils shrink too slowly. I close my eyelids and maybe even reach a hand up to block the light. On a dark road, the light from an oncoming car is both warning and danger in its own right. The diffuse street lamp light corrects much of this on highways, and the row upon row of lights high upon poles glows the highway a sickly, yellowed grey. More often than not, it is preferable to forgo this type of lighting and rely instead on the cars’ headlights and well-designed roads, to reduce eyestrain, and light pollution. The highway streetlight is merely a node in a system that is a snake of light, combined with the vehicles headlights, which can be seen from space. 2. The individual lamppost is always that, individual. There is a moment I love more than any in winter: when a thick snowfall descends through lamplight with little wind to stir it. I lived across from a grocery store in Brooklyn for some time, and there was nothing more beautiful and calming than watching thick snowflakes pass ponderously through the cones of light in the empty parking lot. 3. The man in a trench coat lights a cigarette, then steps into the sharply delineated/delineating light. The staple of noir fiction is the transition from darkness to light, but light within darkness, a spotlight. We might make some severely simplified comments about the detective work done in these fictions, the image of the streetlight, the metaphor of the shadow, but I don’t think anyone needs to hear about that. Instead, I think it is more fruitful to think about how streetlights function in an everyday context. They are, I believe less than illuminating structures. Rather than serving as passive beacons they are the most accepted tools of surveillance. This, I believe is true even if we ignore the many cameras and various other “security” tools that perch atop these lights these days. 4. At night, standing beneath the light, you offer the world a challenge to act as audience to a behavior that, as it is marked as nocturnal, while fully illuminated, is both completely known and mysterious, and ultimately, criminal. One needs only the slightest movements to garner suspicion, while firmly within the gaze. We might see, here, how the street lamp functions as an eye, and freezes the pedestrian in the moment of entering and exiting a light. This transgression is the movement created by the static/active light emitted from the lamppost. The streetlight thus conducts the pedestrian safely along, determining the appropriate path—highlighting danger by absence—and critiquing the pedestrian as possible and continual transgressor, by drifting in and out of the light. Centuries earlier the job of streetlight was performed by children who would pick the safest route through the twisting medieval streets with a lamp in hand. I can only imagine there was a certain amount of disgust that these linkboys had for their charges, who were their social betters, even while in a position of vulnerability. 5 A few years ago a car or something had run into a lamppost on a rainy day. By the time I walked by, the car was gone, but the lamppost remained on the ground, the glass shattered wetly across the ground. Surprisingly, the light was still shining. The way the light splashed across the pavement was so different than the normal, judgmental character of the light. In its brokenness, the light asserted a certain artistry, became active for the sake of creation rather than for the sake of surveillance. 6. We do not speak under streetlights. We glance up and feel the pressure to be elsewhere. 7. When I was younger, I, in my country perfection, went deer spotting with a friend and his youthful dad. This consists in merely shining a spotlight out into a field at night and discovering, almost every time, that there are a number of deer in it. In rural western Pennsylvania, this is not surprising, and the activity bored me. 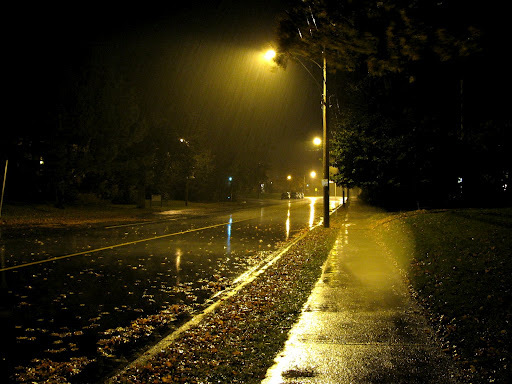 As we turned back into our little town, however, the youthful dad showed how the streetlights operated by sensor by shining the spotlight at them and, thereby, turning the streetlights off. One after another, we drove slowly along, shining our own light upwards, leaving the street behind us in darkness.